This cute and useful pincushion is the perfect gift for a mom who loves to sew. Paint the pot green and set aside to dry. Then, cut out a piece of black felt large enough to cover the Styrofoam ball. Using craft glue, affix felt to top half of the ball. Tie the rubber band around the ball’s circumference, leaving the bottom half unglued. Cut out flower petals from the yellow felt and glue just inside the lip of the pot. Then glue the ball onto the top of the pot. Voila! 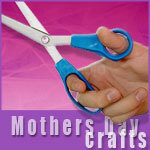 Visit our holiday craft site, Holiday Arts & Crafts on the Net, for these additional Mothers Day craft projects. If you can’t afford gold or silver, you can still give mom a special piece of jewelry on Mother’s Day, like this bracelet made from buttons. This magnetic photo frame is the perfect place to display your favorite picture of you and your mom. More than anything else on Mother’s Day, your mom probably wants a little R&R. Bath salts are the perfect solution – as long as you make sure to clear an hour for her soak in the tub, too! This recipe is easy to make with ingredients you probably already have at home. Whether you make one of these crafts for your mom – or buy her a special gift instead – be sure to include a handmade Mother’s Day card. This handprint card is perfect to make with little kids.